In our last post we talked about the all-important ways to keep your children safe in the garage, including a list of measures that should help prevent your little ones from getting hurt or trapped. The fact is, between teetering stacks of boxes, leaking chemicals and misaligned doors, the garage can be a hazardous space for adults too. Here is our list of easy ways to improve the safety of your garage for all of its users, whether you have children or not. 1 – Tidy up. It might seem obvious, but a cluttered garage is the fastest way to A&E. 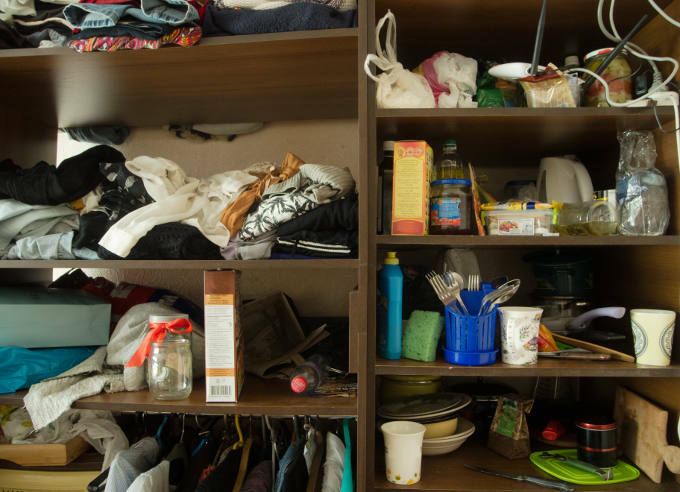 Avoid storing things on the floor that might become trip-hazards, like garden hoses, tins of paint and boxes etc. that sit below knee-height. If your garage ceiling is high enough to store things overhead, make sure everything is kept well above head-height. Installing shelving or cupboards is the best way to give everything its own ‘home’, and keep it out of your way. 2 – Store chemicals, paint and flammable substances somewhere secure. As much as possible they should be kept somewhere out of reach of children, pest-control products, weed killer, anti-freeze, paints, thinners and glues should be also be housed somewhere they can’t easily be knocked or damaged. You should also keep these containers away from heat and direct sunlight. 3 – Keep your garage door in check. To keep the contents of your garage (and home, if it’s connected) safe, it’s important to have a robust garage door that isn’t easy to break into. However, these doors can also be quite heavy, and can lead to serious injury if they malfunction. Make time to regularly carry out essential garage door maintenance and if you have any concerns, please call our specialist technicians for an inspection and repair. 4 – Be sensible with ladders. There are two common problems when it comes to ladders in the garage; storing them poorly and failing to use them when necessary. Simply leaning a ladder against the wall is asking for it to tip onto someone walking past or a parked car. Many people also can’t be bothered to grab a stepladder when reaching for things on high shelves, often causing them to lose balance and cause themselves an injury. 5 – Make it light and bright. Lighting is often an afterthought in garages, and many homes only have a dim fitting in the centre of the room. Ideally, all work areas, steps and storage spaces will be well-lit so that you can clearly see all hazards. If you can’t install new lighting, bring a portable work lamp into your garage when you’re using it. All of these steps may seem like common sense, but with hundreds of garage-related accidents occurring in the UK every year, it’s better to be safe than sorry!